Dover Publications is a reprint publisher and I’ve really enjoyed a number of the works that they’ve selected for re-publication. This novella from Fritz Leiber, a giant in the golden age of fantasy and science fiction, is a once-lost treasure. Leiber is often associated with fantasy, and more precisely, Sword & Sorcery (a term he coined), but he did write more ‘conventional’ science fiction as well, as is evident here. This story is a post-apocalyptic tale, written about the same time as some more famous post-apocalyptic novels (Alas, Babylon  and A Canticle for Leibowitz ). This story follows a loner, a scavenger, Ray, as he tries to survive in The Deadlands (an area of the United States devastated by nuclear holocaust). He encounters a woman, Alice, both of them showing signs of radiation poisoning, both of them wary of the other but looking to trust someone, somehow. As they meet, they slowly begin disarming in front of one another, to show that they are safe. Once completely naked (the only way to show that they aren’t still hiding something) they enjoy a more intimate encounter. Ray and Alice, mostly out of convenience, stick together and encounter another Deadlands survivor, whom they come to call Pop. The trio, sticking together for safety in numbers reasoning, engage a stranger who lands a spaceship-like craft in their area. They hijack the ship, press a load of buttons hoping to find an auto-pilot. They have no destination other than to get away from where they are. But is the grass greener on the other side? This story definitely has a dated, 1950’s/1960’s feel to it, but at the same time could easily appear in a sci-fi magazine today. Post-apocalyptic stories are still vogue, and Leiber’s themes of questioning man’s morality and what it means to be human are still strong themes in today’s literature. This is a story well worth reading. Looking for a good book? 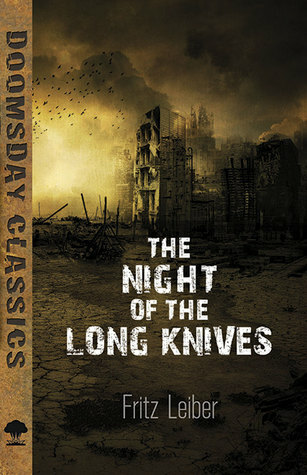 This reprint of Fritz Leiber’s The Night of Long Knives is a short science fiction novel from the early 1960’s that is still a strong read today.